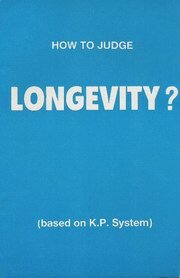 In this book, the author has chosen to write elaborately on Longevity duly giving various lessons to make easy for the students of Astrology to assess total span of life from a nativity or a Horary Chart, to make the student thoroughly familiar with the principles under the system of Sub Theory and also to arrive at the significators connected to Maraka and Badhaka houses. The entire lessons are treated with clear explanations under Krishnamurti Paddhati (Sub Theory) which is gaining momentum and it has certainly revolutionized the whole concept of the predictive science of Astrology. 25. Doctor gives number to know the longevity of the patient.